​After 14 years' running The Bower restaurant in Manly, Jamil and Tara Ben Hassine took a big break. They moved to Tunisia, where Jamil grew up, for 18 months, but the Arab Spring brought them back to Sydney. They were looking for a small business, perhaps a hole-in-the-wall cafe, something less demanding. Then they saw the heritage-listed corner terrace on Blues Point Road – two storeys with multiple rooms, a back garden, and views of the harbour bridge. 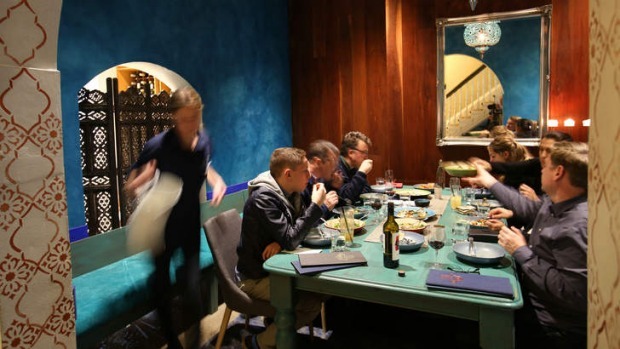 It was not by any stretch of the imagination small, but they succumbed, and after major renovations, opened Moorish Blue in December, serving a modern mix of North African flavours. The front door, lined with swirling Tunisian-style blue-and-white painted tiles, bears the words Salam aleikum - Peace to you. Entering on a Friday night, it's not exactly peaceful. The whole place buzzes with guests, music, waiters and chefs in the open kitchen. There's a 21st party upstairs, a large group around the private chef's table downstairs, and the main dining room is packed. The creative details continue inside. Tara is an artist, and her paintings hang on the walls, from painstakingly detailed and magnified leaves to sensual, colourful orientalist scenes. She also painted the walls, and hand-stencilled the patterns on the wooden tables. Our table, for a preschool mums catch-up, is tucked in a corner. As ever, chat keeps distracting us from the serious business of ordering, but the young staff remain patient and smiling. The food, like the surroundings, is colourful, lively and generous. 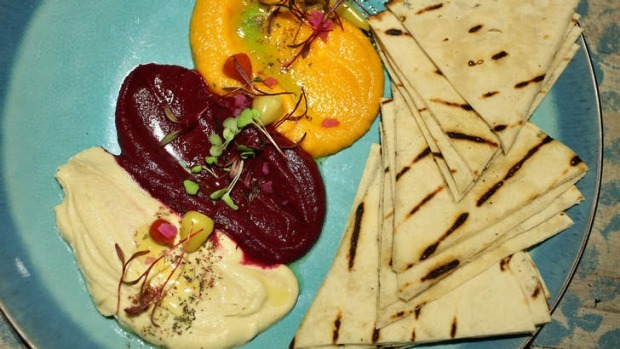 To start, we share a bright trio of dips – beetroot, carrot and hummus – with plenty of feather-soft, warm Moorish pita bread. A salad of beetroot, rocket and goat's curd is scattered with crunchy candied walnut halves, crispy green pear and juicy barberries. 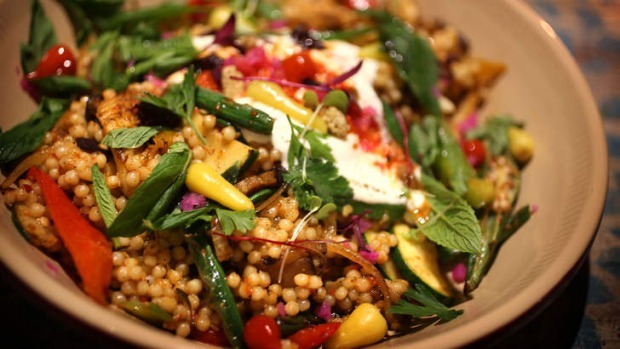 Wok-fried calamari with the perfect tender bite comes with a riot of other elements, including the large North African mahgrebi couscous, okra, pumpkin, harissa and preserved turnip. The effect is bounteous rather than overwhelming. While Tara is in charge of decor and front of house on weekends, Jamil oversees the kitchen. On the specials board tonight is cinnamon-peppered pork fillets with fava bean puree and white mulberries. Again, it revels in different flavours and textures, with broad beans, golden raisins, pine nuts, baby figs and a kick of heat from the pepper with the hearty serve of tender pork. The small, sweet, chewy dried mulberries are a distinctive finishing touch. The talk around the table never pauses, but at some point, someone thinks to order dessert. 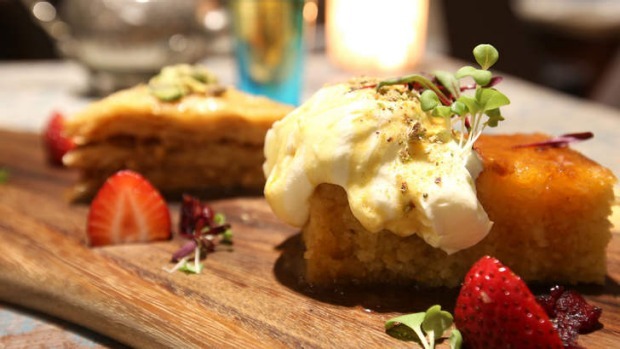 Two classics arrive: a Tunisian orange syrup cake topped simply with cream, and luscious, crisp baklava with pistachios, accompanied by ornate silver pots of mint tea, and gold coffee pots, like small, decorative Daleks. Good, for the generous servings and ingredients.